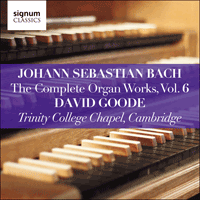 David Goode's sixth Bach instalment taps into the rich seam of Christmas-inspired chorale preludes and variations, and includes many from the 'Kirnberger' collection. The organ loomed large from early on in Bach’s life. The foundations of his multifaceted career as a professional musician were clearly laid in the careful cultivation of Bach’s prodigious talent as an organist whilst he was still a child. Johann Sebastian Bach was born in Eisenach in 1685, and after the death of his father—the director of municipal music in the town—at the age of ten moved to Ohrdruf, where he was taken in by his eldest brother, Johann Christoph. Christoph was the organist at St Michael’s Ohrdruf and had been taught by Pachelbel. During his years at Ohrdruf, the young Sebastian was a choral scholar and likely had his first experiences in organ building and maintenance. In 1700 he moved to Lüneburg, as a choral scholar at St Michael’s School; this move brought him into the orbit of many organists, including Georg Böhm and Adam Reinken in Hamburg. 1703 found him examining a new organ at the New Church in Arnstadt, where he was appointed as organist in August of that year, remaining for four years, his first major professional organist post (Wolff 2001 p.526). Clearly showing remarkable talent as a player from an early age, Bach’s career remained founded upon the organ even as he moved around in a variety of posts after leaving Arnstadt in 1707: as the organist of St Blasius’s in Mühlhausen (1707-1708), court organist and chamber musician at Weimar (1708-1717), capellmeister at Cöthen (1717-1723) and cantor at St Thomas’ Church in Leipzig (1723-1750). Given that strong foundation, it is no surprise that organ music flowed from Bach’s pen throughout his life. Yet how do Bach’s organ works cohere? For the monolithic notion of ‘The Complete Organ Works of Bach’ is misleading. The picture is more fluid, even unclear, both as to the veracity of individual works and of their particular chronology. The impression is of a combination of works that have reached us in their present form through an often uncertain process of revision and collection (such as the Six Sonatas, BWV525-530) and those with a more definite origin and/or date, such as Clavierübung III, which was published in 1739. Even a collection with a clear didactic purpose that is apparently easy to date like the Orgelbüchlein, BWV599-644 (its title page is dated to 1722 or 1723) can remain opaque in the chronology and detail of its contents: the title page was added later than the chorales it contains (Williams 2003 p.227). Many of the preludes and fugues do not exist in autograph form, a fact that in most cases does not affect the question of authorship as much as that of the date of composition, although the authorship of some organ works previously assumed to have been by Bach have been called into question, like the Eight Short Preludes and Fugues, BWV553-560. Others are easier by virtue of their singularity either to ascribe authorship to, such as the Passacaglia, BWV582, or to date, such as the Concerto Transcriptions, BWV592-596, which are from Bach’s Weimar years (Williams 2003 p.202). However, the fluidity of the corpus is not as interesting—or as significant—as the stylistic and generic variety it exhibits. God is a harmonic being. All harmony originates from his wise order and organization … Where there is no conformity, there is also no order, no beauty, and no perfection. For beauty and perfection consists in the conformity of diversity. Ever since the discovery of Bach’s personal Bible commentary, the so-called ‘Calov Bible’, it has often been noted that Bach’s music appears to have been intended as an expression of a specifically, and personally-held, Lutheran faith. The implications of this in seeking an informed speculation of Bach’s theological views of music are significant. For the indications in Luther’s writings are not only that he saw music as inherently theological on a number of different levels, but specifically that he saw music as having a role in moving the believer’s affections towards God, and thus an ability to strengthen the believer’s faith in Christ. Combining this insight with the commonly-observed (though not unchallenged) evidence of the Baroque Affektenlehre (or ‘Doctrine of the Affections’) in Bach’s music, it can be seen how often Bach’s sacred music (chorale-based or liturgically intended; often both) makes its spiritual utility felt through its projection of a relevant and (sometimes) dominant affekt. This primary affekt is then projected through the musical material, itself often consisting of harmonic and motivic workings-out of a single inventio, or dominant musical figure. In the organ music, this notion is perhaps most useful in approaching the chorale preludes—a genre that covers many of the organ works—where in many cases the background text, where clear, often illuminates both the general affekt of a given prelude, and the specificity of particular harmonies and figurations that have been chosen to illustrate it. Although the label of ‘The Complete Organ Works of Bach’ for the corpus is a misnomer, there are still many varied ways in which to view it coherently; theological aesthetics is just one example. Theology and aesthetics combine throughout Bach’s organ music, uniting them as works that project a Christian Lutheran worldview through their specifically musical beauty. In this they serve as exemplars of the theology of another towering eighteenth-century Christian intellect, whose published thought also combined beauty and belief with an emphasis on the affections of the believer: the American pastor Jonathan Edwards, with whom Bach has once been compared. Edwards placed the affections-of-the-heart at the centre of his definition of genuine Christian experience, and thus taught that moving them God-ward was the primary aim of any means of grace in the church, whether preaching or music. As examples of Edwards' affection-driven theology in practice, the organ works of Bach clearly cohere in their common ability to promote both belief and beauty, or perhaps more accurately, belief through beauty. This album seeks to bring together pieces among Bach’s organ music that refer implicitly or explicitly to Christmas. All the chorales are those associated liturgically and theologically with Christmastide, and the programme includes works such as the ‘Pastorella’ whose musical qualities invoke forms associated with the festive season, or the ‘Canonic Variations on Vom Himmel Hoch’, a work whose title indicates Bach’s wish that it be played in the Christmas season. The bookended Preludes and Fugues have also been chosen for their joyful affects, giving a more subjective taste of the Christmas spirit. The prelude of BWV550 is reminiscent of Buxtehude and Bruhns, and not as well known as its cousin, BWV541. Written in three-time, it is tightly constructed from its opening motive of a suspirans (three quavers after a rest), which develops into a running quaver figure that permeates the whole. A manual introduction leads into a pedal solo, which is followed by a lengthy pedal point. The bulk of the prelude consists of attractive sequences, eventually coming together for the final cadences over long held pedal notes. The prelude closes as it opens, with the suspirans figure tumbling in three-fold repetition. There follows a three-bar transition, in four-time, to move the harmony toward the dominant in preparation for the fugue. The fugue starts with a jaunty six-bar subject, alternating crotchets and quavers. Some syncopated rhythms in the countersubject play against the more rhythmically solid subject. Later episodes develop the shortened anapaest rhythm (short-long), developing it in sequence. The final page, with the pedal entry, sees the texture move from three parts to four, providing a satisfying and virtuosic conclusion to an otherwise playful fugue. BWV738 is a sprightly setting, full of semiquavers, and stile brisé figurations—the broken-chord texture typical for harpsichord music. The chorale melody is easy to pick out at the top of the textures, amidst the decorations. These are given as semiquavers that have a triplet feel, given the use of two time signatures: 12/8 and 4/4. The figurations in the manuals often go against the beat, giving the music impetus and vitality. BWV723 is a gentle setting with the right hand playing a plain version of the chorale over a fugal left hand and pedal accompaniment. There is a harmonic and contrapuntal simplicity to the prelude, with the chorale singing out over the three lower parts, resulting in a meditative, gentle affect. The chorale is given straight, but ornamented, with virtuosic episodes to link the lines of the chorale, the same treatment as other chorales on this disc such as ‘In dulci jubilo’, BWV729. This type of prelude allows for virtuosity, not only in the figurations but in the harmony. BWV722 is notable for the final cadence, extended with multiple chromaticisms, such that when the final (major) chord resolves, there is a great feeling of gladness. BWV710 is given a trio treatment, in a lively 6/8, with the chorale melody in the pedal: it is in the style of an instrumental trio, with two violins and cello. The melody forms the bass of the harmony, below an attractive sparring between the two voices, writing full of harmonic turns and elegant trills. The final phrases of the chorale are presented with beautifully wrought suspended harmonies in the manuals, given in invertible counterpoint. As with BWV722, BWV729 presents the chorale played in homophony, as though in a liturgical setting, but with interpolations between the lines that sound extemporary. BWV729 has been made famous through its traditionally being played at the end of the service of Nine Lessons and Carols at King’s College, Cambridge. In the prelude, the interpolations become increasingly more virtuosic, with the note values increasing from quavers to triplet quavers to semiquavers. Despite the florid nature of these insertions, the overall affect of BWV729 is one of gravitas, which is striking given the more dance-like feel that can arise from the compound metre given to the chorale. The ‘Pastorella’, BWV590, is a four-movement sectional work. It is unique in Bach’s keyboard output, though details such as the key scheme and structure suggest an Italian sonata model. The first part is a gentle piece in a pastoral F major, set in a lilting 12/8, with the left hand on the plaintive vox humana stop. A striking feature of the piece is the pedal point: the counterpoint in the manuals unfolds over long, held pedal notes that underpin the harmony and give a feeling of expansiveness and space. This leads to the second section, in the dominant key, played here in a rustic style, as though on woodwinds. The third section gives the hint of a darker affect, set in the dominant minor: a melancholy right-hand melody singing over a left-hand accompaniment. The spritely, joyful, final movement reverts to F major, in the original 6/8 time. The pastoral affect of the work, though strictly only applicable to the first movement, is underscored by the fact that each movement subtly includes a drone, features that link the work with other festive pastoral movements, such as the ‘Pifa’ from Handel’s Messiah. The so-called ‘Jig’ Fugue is an anomaly. With a subject similar to Buxtehude’s Prelude in C, BuxWV174, its authorship by Bach has traditionally been challenged, although more recent scholarship has confirmed BWV577 as indeed by Bach. Not attached to a prelude, the Fugue stands alone, a fact that also fittingly reflects its unique musical character. The ‘jig’-like nature of the affect is obvious from the start of a long winding subject, with wide intervals and four clear sections, each musically distinct. The variety and richness of the subject makes possible a colourful fugue that dances along through a number of episodes. BWV769 is an example of Bach’s tendency to take a genre, or a technique, and exhaust its capabilities. This can be seen in other large-scale works such as the Art of Fugue or Clavierübung III. In this case, with astonishing technical virtuosity, Bach not only writes a series of canons on the chorale, but in doing so deliberately explores all the possible intervals for canons, except the fourth. Also, there are canons explored in all possible textures between the right hand, the left hand, and the pedals. The depth of rational thinking behind the work reflects its origins: BWV769 was published in 1747, and presented to the Society for the Musical Sciences in Leipzig, of which Bach was a member. It also relates to other canons written by Bach around this time, such as the Fourteen Canons BWV1087, and the canons in the Goldberg Variations (1741). Peter Williams notes that there are striking motivic similarities between the chorale ‘Vom Himmel Hoch’ and these other canons, especially the famous canon BWV1076 on a bass line, and bass-lines found in the Goldberg Variations: it seems Bach was exploring the canonic possibilities of this chorale across a wide spectrum of pieces. BWV769 unfolds five canons, though their order crucially depends on which one of two extant versions is selected: BWV769, or 769a. BWV769 is older, and is the version played here. Note that Bach’s title for the work highlights that one reason behind the selection of ‘Vom Himmel hoch’ is its Christmas associations, with its theological overtones of the incarnation. i) Canon at the octave between the right hand and the left hand, with the chorale in the pedal. The semiquaver scales give the impression of bells, or perhaps the flutterings of an angel’s wings. ii) Canon at the fifth between the right hand and the left hand, with the chorale in the pedal. The writing is reminiscent of the trio sonatas here, with a violinistic style in the manuals. iii) Material based on the chorale is given in canon at the seventh between the left hand and pedals; the chorale itself can be heard in the right hand at the top of the texture. The harmony achieved here is beautiful, with some expressive dissonance. iv) Canon in augmentation at the octave, between the right hand and the left hand. The chorale is heard in the pedal. Again, some striking harmony is presented here demonstrating Bach’s way of turning an academic exercise into something also aesthetically pleasing. v) The final movement is a tour de force: the chorale is given in canon, at the sixth, and inverted between the right hand and the left hand; then at the third; then at the second between the pedal and the left hand; then at the ninth between pedal and right hand. The five movements are then rounded off with a grand six-part texture, with all four phrases of the chorale appearing at the same time, in the manner of a quodlibet. To cap off the astonishing richness of this end, there is a brief rendition of the B-A-C-H motif embedded in the texture, Bach signing his musical name off. BWV696-704 share a common form: little fughettas, or small fugues, all for manuals only, all on the openings of their respective chorales, making the setting instantly recognizable. The chorales have all been chosen for their textural and theological connection to Christmas. BWV696 is conceived in an elegant, stately style, with some ornamentation in the inner parts, perhaps seeking to invoke a gentle ‘praise’ to Christ suggested in the text. A slow harmonic rhythm underneath a steady quaver movement gives rise to some striking chromatic harmony throughout. BWV697 is also elegant, with attractive running semiquavers that accompany the steady quaver rhythm of the subject. The stream of semiquavers, provided first by the countersubject, are linked by one scholar to the ‘Angel Throng of other Christmas chorales’ (Williams 2003 p.436), also referenced in the text: the ‘Engelschar’ who rejoice in the truth of God born man in Christ. BWV698 is infused with the motifs and intervals of the chorale melody. The initial subject of the fugue, in the right hand, is accompanied by an anapaest rhythmic figure (short-short-long) that has an influence all through, with a move to running semiquavers by the end, whose notes ingeniously hide the notes of the chorale. Also, prominent throughout are the snatches of the chorale melody heard in steady crotchets. There are at least two ideas in the text that are perhaps reflected in the pervasive use of fast notes in the prelude: the ‘sprouting’ (entsprossen) of the Son from the Father in the incarnation, or the rays of Christ the morning star that ‘stretch’ (strecken) to the distance. BWV699 is a setting with hints of real yearning, perhaps reflecting the theme of waiting that is present in the text of this Advent chorale, given musical expression though the use of suspensions. Played very softly on this recording, the work reflects an introverted affect of Christmas joy. BWV701 is given in an airy three-part texture, characterised by semiquavers, perhaps highlighting the idea of descent ‘from heaven’ (von himmel) of this Christmas chorale’s title. As the harmonies shift, so the subject moulds to fit them by quoting other lines of the chorale’s melody. In some of the counterpoint, especially the use of scalic figures, this little prelude perhaps forms a little study for the Variations on this chorale, heard above (BWV769). BWV703 is harmonically striking; though it starts in F major, Bach soon introduces an additional flat, moving the harmonic focus towards the flatter subdominant side (B flat major), before cancelling the flat at the last moment to land the end of the prelude back in F major. Given the association in Bach’s music often made between the flat side of the circle of fifths and theological ideas of the Christian believer’s enemies—death, Satan, the law—it is plausible that this exploration of the flatter side of F major links to the idea in the text of the ‘raging of the devil’ (Teufels Wüten), against which the text is asking God to protect the Christian. BWV704 is again concerned with praise, as was the first of these fughettas. In this prelude, as with the previous BWV703, there is some very striking harmony produced in Bach’s setting. Like BWV703, it is harmonized in F major for the most part, but the harmony moves to close the prelude on the dominant of the relative minor, A major, a key which also sets the scene for the final work on this album. It seems that the Prelude and Fugue of BWV536 were conceived together, and though some confusion has arisen over an additional version (BWV536a), it seems plausible that BWV536 is an earlier work by Bach. Broken arpeggios up and down the keyboards introduce this charming little prelude. Though in the North German style of Buxtehude (the opening arpeggios are reminiscent of those at the start of Buxtehude’s D major Prelude, BuxWV139), it has harmonic and melodic touches that are all Bach. The arpeggiated opening leads into a transition marked by pedal points—long held pedal notes above which the harmony and virtuosic manual writing unfold. The rest of the Prelude develops the arpeggiated figures with chains of beautifully-wrought suspensions. A slow descending subject in three-time opens the fugue. It is suggested that subject bears a resemblance to the sinfonia of Cantata 152 (1714); but the key of the Cantata is G minor, so the resemblance is slight. The fugue is set in the form of a melodious triple-time dance—a minuet, or forlana—which unfolds spaciously through several episodes that direct the music toward a wonderfully inventive final section, full of ingenious contrapuntal intricacy and suspensions. A final pedal solo—a descending arpeggio figure, derived from material heard previously in the fugue though perhaps also consciously invoking the start of the Prelude—brings the fugue to a close.